(L-R) Tracy Letts, Amy Morton, and the initial supply of booze. Image by Michael Brosilow. I have experienced this same production using the same designers, director and most important the same actors in another city in another calendar year and have written about it with great enthusiasm. In March, 2011 I sat in the front row of the fan-shaped Kreeger Theater at the Mead Center for American Theater (yeah, Arena Stage) in Washington, DC and was swept away. The confluence of Marthas of the past and this particular Morton-embodied present transported me. All is well, all has survived, all is revelatory, and I can’t wait to return for the human storytelling now taking place at the Booth Theatre. Many reviewers have had a chance to engage with this production in Chicago and now in Washington. Most seem to focus on the power of George in the hands of Letts. What a surprise, they suggest, that the milquetoast husband, often presented as the object of a verbal onslaught for the play’s three acts who finally and ultimately has had enough and speaks up and plays, in fact, the trump card in the game the couple has been playing for years in private to keep some of their emotional baggage in check. My reaction to this production is not surprise but the sense of: my goodness we at long last see the balance always intended in this script. The whorl of emotion, the shouting and carrying on, the blowsy insults (yes I’m thinking of you, lovely and personally generous Dame Elizabeth as I write these words) of prior Marthas tend to overshadow the sad wit, the subtle detailed gamesmanship in her words that have always been there, all along. This is no one character’s play. They all create the games together. I have nothing to offer beyond that to my current responses. Yes, the taut structure and carefully calibrated emotional tension and release of these performances survive intact on the intimate Booth stage. Once I was assured that this NYC ride with these characters would be as revelatory as my DC ride with them, I settled into enjoying other elements of the production. The piles of dusty books, the well-worn furniture, the scuffed edges of doorways and banisters And my greatest side entertainment — tracking the alcohol intake, as best I could, for each of our four characters through each of the three acts. I can’t claim perfect scoring (drinks might have been topped off in a part of the action on which I was not focused, that kind of thing), but here’s the rough break down. Martha — Act I 4 drinks, Act II 3 drinks, Act III 2 drinks. George — Act I 4 drinks, Act II 3 drinks, Act III none. Honey — Act I 5 drinks, Act II 1 drink, Act III none. Nick — Act I 2 drinks, Act II 3 drinks, Act III 1 drink. George is cold sober through the final revelations; rare drinker Honey exceeds a limit which sends her into the bathroom by the end of Act I; Martha maintains a steady flow yet tapers off with the final Act’s revelations; and Nick tries to keep up with little success. The pacing of the alcohol consumption is as exquisitely balanced and rings as delightfully true as the rest of this powerful production. Now I just have to manage to get myself to this theatre at least one more time to emerse myself again in new or familiar dimensions of this fine fine production. 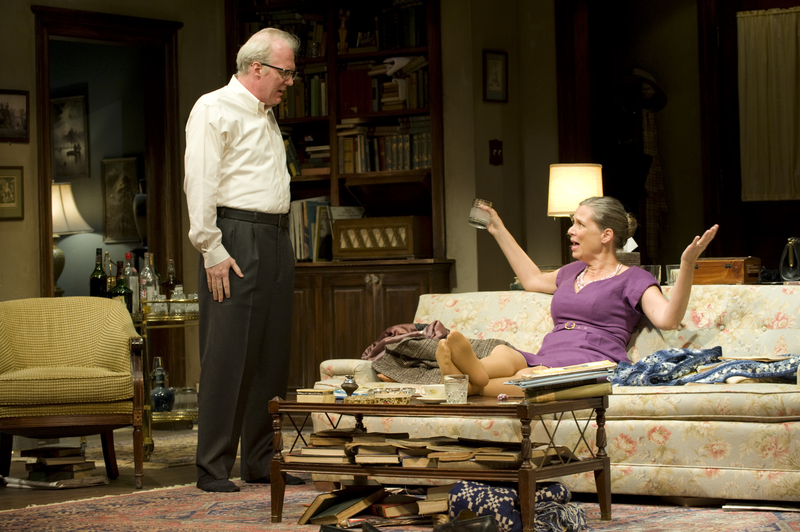 Tagged as: Amy Morton, Booth Theatre, Edward Albee, Pam MacKinnon, Tracy Letts, Who's Afraid of Virginia Woolf?